Planted aquariums can be visually stunning and a great environment for livestock. However, you must commit to the all important regular maintenance routine that comes with them. Missed water changes or fertilizer doses, clogging of filtration, lack of water changes, CO2 running out, and plants being overshadowed all contribute to plant health deteriorating or algae rearing its head (or both). For example ‘black brush’ algae (BBA) is heavily CO2 related and cyanobacteria is often in relation to a lack of nutrients or restriction of flow. 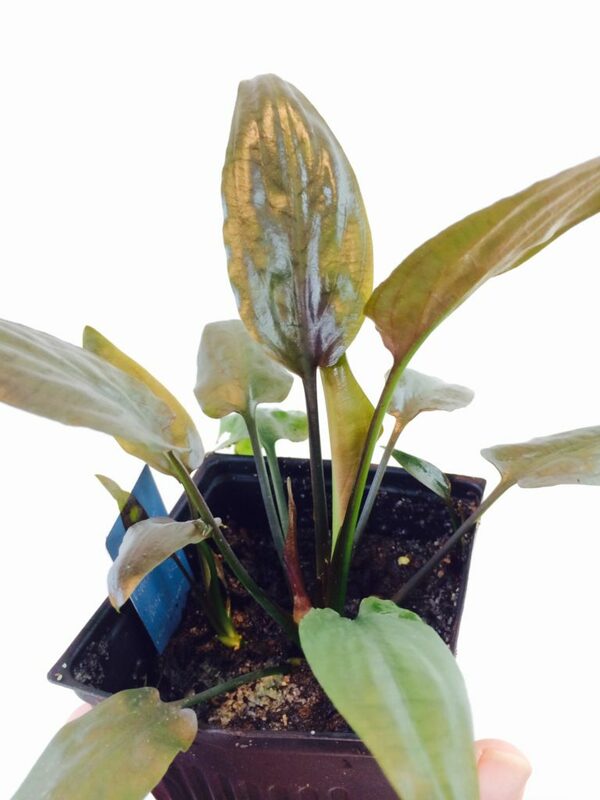 Lack of CO2 will cause plants to melt from the bottom upwards as they replenish resources, and lack of nutrients could result in anything from a few pin holes on older leaves to the plant completely melting. 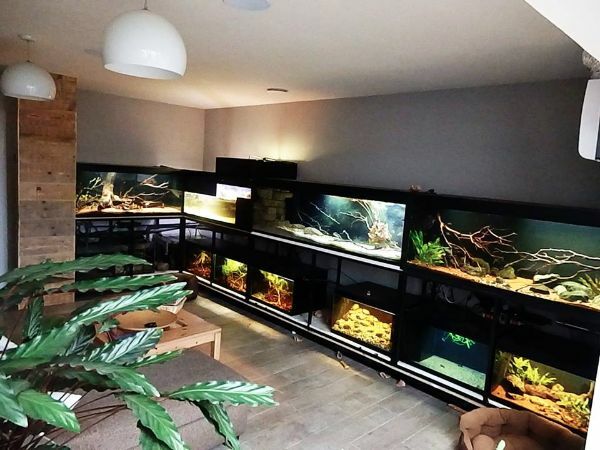 With a regular schedule of maintenance we can avoid many problems associated with keeping a planted aquarium, or any aquarium. Here are some details of a good maintenance routine, how often we carry out each action, and the reasons behind it all. This will give you visual guides as to whether your CO2 system is functioning properly. It is not unheard of for needle valves to malfunction or for solenoids to stick open – both of which could lead to CO2 toxicity and death. Observing livestock for distress each day is also a very sensible idea. Our fertilizer routine is to separate macro (Nitrogen, Potassium, Phosphorus (NPK)) And micro (trace elements) nutrients into two bottles. Dose your macro nutrients 3 times per week and micro 3 times per week (alternating days) with a rest day before water changes. Dosing little and often ensures that the plants never go without nutrients and things are kept consistent. With only a dose once every week or two, you run the risk of nutrients being depleted before your next dosing which can lead to plants suffering and algae developing. If using bottled fertilizer we would suggest splitting up the recommended dose into daily doses and increasing dose size if signs of nutrient deficiency arise. When using a liquid carbon product these should be dosed daily too. 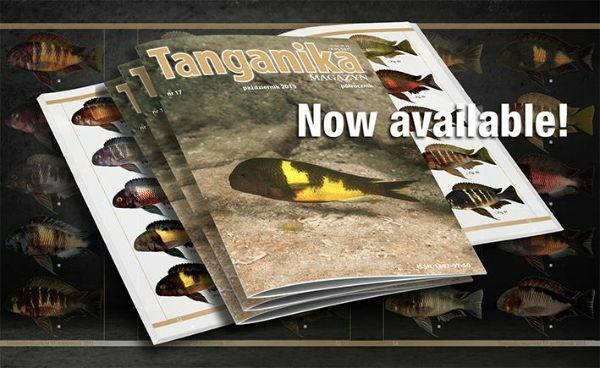 Water circulation, or water flow, is what distributes the all-important salts and gasses around the aquarium evenly. With flow restricted or blocked plants can’t get access to enough of the compounds they need for photosynthesis and development which leads to several issues including deficiency and cyanobacteria. 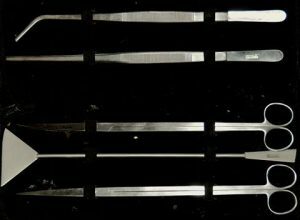 Reduction in flow or flow ceasing completely can also have ill effects on beneficial bacteria used for filtration. Plant debris can easily clog a filter intake strainer and restrict flow, so it is important to check on a regular basis. It is even more critical if you use a spray bar for surface movement and gas exchange. Something often overlooked is the water level of the aquarium. 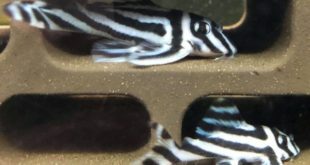 Evaporation can be fierce in an open top aquarium and if the water level fluctuates then surface agitation can fluctuate. In some instances this can make CO2 levels fluctuate. Stable gas levels are an important part of CO2 usage, you want to avoid fluctuation during the photoperiod as much as possible. If the water level drops below the height of a spray bar or filter output and the water surface is broken by jets of water, CO2 can be quickly depleted. Cheaper plug type timers have a habit of failing so have a quick peek each day to double check. The light being stuck on 24/7 without you noticing won’t end up pretty. Having the CO2 stuck on all night is a whole different matter which can lead to disaster. Trimming, tidying up, and large water changes should be performed weekly. This will make things easier when carrying out maintenance. Trimming species like riccia or fissidens with water still circulating is comparable to little winter scene snow globes. A lot of the small trimmings will settle amongst other plants and can be a nightmare to clean up. 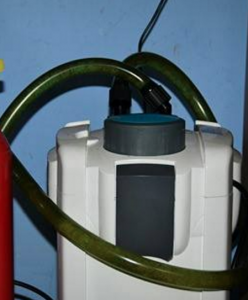 It is easier to turn off the filtration temporarily and will not harm your tank. This is an important part of maintaining an aquascape. 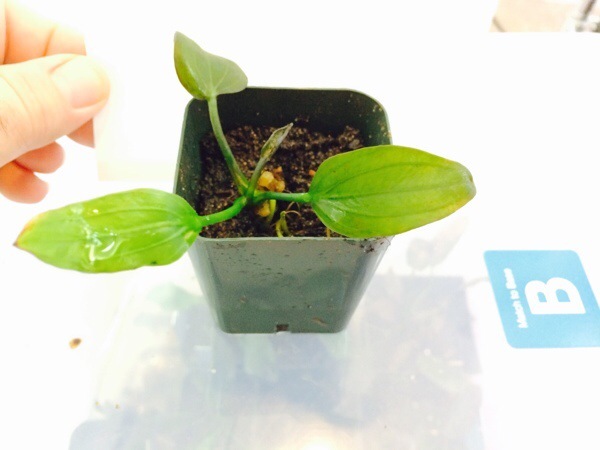 Without trimming, plants can be overshadowed and photosynthesis stops because there is no access to light. Certain plants like Hemianthus callitrichoides will eventually lift out of the substrate if not trimmed. Many mosses will begin to rot from the underneath as they become blocked of light and circulation becomes insufficient. 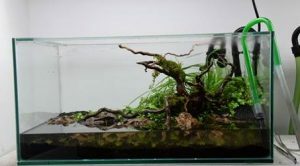 Trimming, or uprooting and replanting, also helps keep perspective of layout and prevents the overgrown messy look (which can look awesome but doesn’t suit every aquascape). Always do trimming and uprooting before a water change in case any mess is created. Once finished, use a net to clear up any trimmings floating on the water surface. A healthy water change afterward will clear out the tank from debris left over. Glass is a prime position for green spot algae and the longer you leave it the tougher it becomes to scrape off. There are several theories about the cause of green spot algae like low PO4, low flow, too much light, etc. All of these suspected causes will improve things if corrected, but in a tank with a serious amount of light still seems to tick over slowly in the background at a unnoticeable pace. If you use 1 watt per litre or more, leave the glass alone for a while and take a camera with a macro lens you’ll see it. Work on a minimum of a 50% water change each week. Larger water changes can being carried out if it was a heavy trim or lots of uprooting. 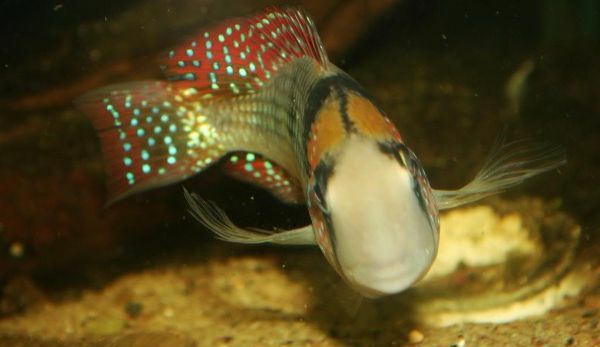 Don’t be afraid to do larger water changes!Large weekly water changes are an important factor in fish and plant keeping for a multitude of reasons. Your frequent water changes are ensuring no toxin can ever reach a dangerous level, it is replenishing nutrients and improving water quality, and preventing disease. Lots goes on in the substrate of a planted aquarium including biological processes and we don’t want to disturb it. Vacuuming the substrate is not something that is needed or wanted as part of our maintenance. However, when siphoning out the old water, hover the siphon above the substrate and plants to pick up any settled debris or waste as this can cause issues in the long run. This one is pretty self-explanatory, don’t forget to turn the filter back on! After reaching this point the first macro mix of fertilizer is dosed. We leave this until last for a very good reason. Whilst hands are in and out of the aquarium, water droplets can often run down the front of the glass. If you cleaned the glass before you’d finished, you would have to go over it again. The last thing you want happening in a high tech aquarium is for CO2 to run out. 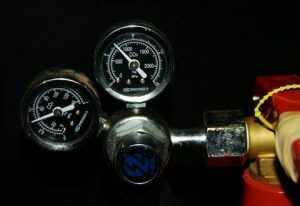 Pressurized systems are usually fitted with two gauges, one is a pressure reading and the other displays the content level of the canister. We strongly recommend having a spare CO2 canister kicking around, but if that’s not possible then get a new one as soon as you notice the reading on gauge getting lower. If you wait until it’s empty to start to source a new one then you may find yourself without gas for a few days or even weeks whilst the shop orders a new one or you can travel to get one. It this happens, expect the tank to punish you with BBA! 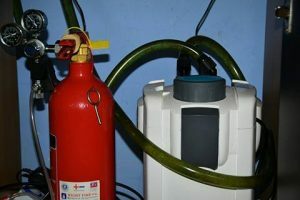 If you’re using a sugar and yeast CO2 system then 1 bottle should be changed weekly for optimal performance, so now is a sensible time to do so. The notion of a ‘dirty’ filter being a better filter is an outdated one, and even more so in a planted aquarium. Dirty filters can clog to reduce circulation and gas exchange, can affect biological processes within the filter, and indirectly have a negative effect towards the war on algae. You don’t need to scrub the media or be rough with it, bacteria is safe. Just a quick dip and gentle swish in old tank water every two weeks is sufficient for cleaning the filtration media and housing. Filter cleaning should be carried out during every other weekly trim and water change between steps 1 and 2. There’s nothing that will draw your attention away from a beautifully scaped tank quite like dirty filter hoses. 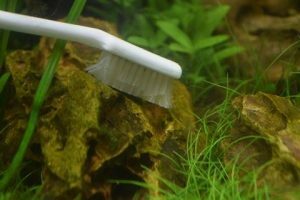 If you go through all of the above effort in maintaining an aquascape then it makes perfect sense to extend that cleanliness to the outside accessories. Wipe your hoses and cords down gently to clean them of dust and whatever other unsightly debris might find their way onto them. Internal ceramic CO2 diffusers have a habit of clogging with age. Knowing this we can clean them before they clog and have the upper hand! This can be done by soaking them in a bleach or hydrogen peroxide solution, then soaking in water overdosed with dechlorinator. For hard water stains you can also use vinegar. Unless you’re using an LED light unit, bulbs should be changed every 9 to 12 months, as after this time certain wavelengths start to lose effectiveness. This doesn’t have to be expensive though, you can save money (up to 6× cheaper) by buying bulbs that aren’t aquatic branded. There is no difference between an aquatic branded 6500k T5 and one that is sold for other purposes like shop fittings (except the name and serial number). The exception being the most expensive ‘specialised’ bulbs that use different or specialised wavelengths (but aren’t a necessity). 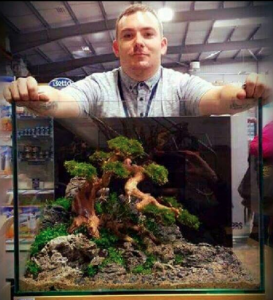 As you can see, a stunning aquascape is far from a ‘set it and forget it’ setup and a fair bit of elbow grease goes into maintaining that perfect look. Don’t let that put you off though, maintenance is half of the fun and well worth the effort! 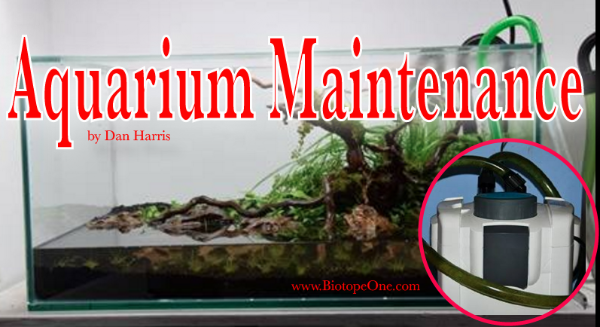 Maintenance also gives you a closer relationship with your planted tank which leads to you enjoying it more. It is worth the effort when you see the results in your tank. Previous Enter the Biotope Aquatic Design Contest Now!